The stone took 18 months to produce. Image courtesy Graff/Donald Woodrow. 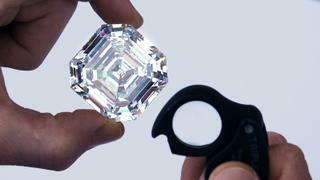 18 months since acquiring the enormous Lesedi La Rona rough diamond, British jeweller Graff has revealed its principle jewel – a 302.37 carat diamond that now ranks as the largest emerald-cut diamond in the world. Named the Graff Lesedi La Rona, the stone has been certified by the Gemological Institute of America as being of top D colour and the highest clarity making it also the largest diamond of this quality ever to be graded by the GIA. Cut from a 1,109 carat rough diamond unearthed at the Lucara Karowe mine in Botswana in 2015 – the second largest rough diamond ever discovered – the final polished stone took over 18 months of painstaking work to produce. Presenting a unique challenge to Graff’s gemmologists, the rough was too large to be analysed with existing equipment meaning a custom scanner designed specifically for the Lesedi La Rona had to be built to reveal the depths of the stone. Following months of analysis, it was decided that the stone could yield one central diamond along with 66 satellite stones, which were announced by Graff in 2018 and range from under a carat to 26 carats. Undertaken by some of the finest craftsmen in the industry, the Graff Lesedi La Rona features an exclusive Graff Cut and is of the highest quality, with the table facet at the top of the diamond taking hundreds of hours alone to polish. While a number of the satellite stones have been set into show-stopping high jewellery pieces, there is no word yet on what will become of the Graff Lesedi La Rona and it is not unusual for a stone of this size to remain with the jeweller as a testament to its skill. The value of the stone has also not been disclosed. The original rough was acquired for an estimated $53 million but it is likely the polished stone is worth considerably more with a 163.41 carat stone of similar quality selling at auction for $33.7 million in 2017.